Men, without a doubt, own at least one bifold wallet in their lives. One that typically opens wide with 8 card slots, with additional side slots and note pockets to slide cash within. It’s simple, classic and definitely fuss-free, and men who love a safe piece will typically opt for the ones in black. The main difference? Besides the most discreet of logos, some of the pieces here are a little different. But still more or less the same. New year. New wallet. Why not? A simple piece that comes with a smooth natural grain leather finish. Finished with a marquetry BALENCIAGA logo in front, this is one wallet that’s perfect for corporate man who still wants to flaunt his street cred. At first glance, Cartier’s version is minimal, coming with a small palladium-finish diamond-shaped Cartier logo on the bottom right. Flip it open, and that’s where the magic happens. Lined in a gorgeous burgundy calfskin interior, the sleek wallet that comes with architectural line detailing is equipped with 6 card slots and 2 banknote slots. Celine has always been known for its sleek and minimal pieces, and this all-new wallet from the luxury brand has certainly set the tone for what’s to come for the men. Also, the grained calfskin exterior is a nice touch, one that will definitely be resistant to daily wear and tear. 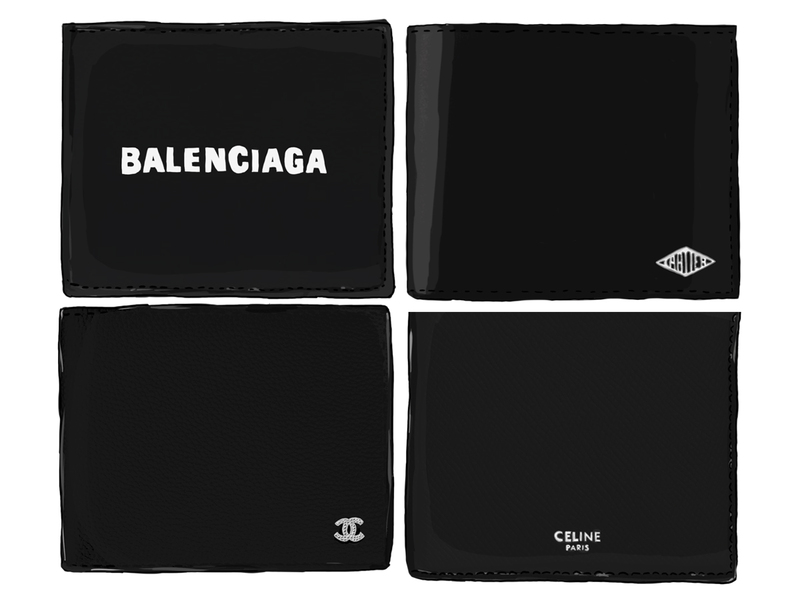 Chanel produces bifold wallets from time to time, releasing them in limited quantities with their seasonal collections. The one above comes from their Cruise 2019 line-up, and is available in a soft grained calfskin that’s lovely to touch. Besides, it’s finished with a ruthenium ‘CC’ logo that male fans of the brand will certainly appreciate. While this version might only come with 4 card pockets, it is furnished with a coin compartment that some men actually prefer. The subtle hand-stitched detailing is a nice touch, contrasting beautifully against the black Romano leather. Well-considered a classic from the Italian luxury house as far as SLGs for the men are concerned. The vintage ‘GG’ logo in brass contrasts beautifully against the black textured calfskin leather, making it a great neutral piece that will go with just about any outfit. Another classic favourite has got to be this evergreen piece from Loewe. The repeat Anagram pattern makes this the only piece in this list to feature multiple logos, but there’s something about the way the logos have been placed that makes it less of a design element, but rather one that’s literally engraved into the leather, giving it a beautiful, textured finish. 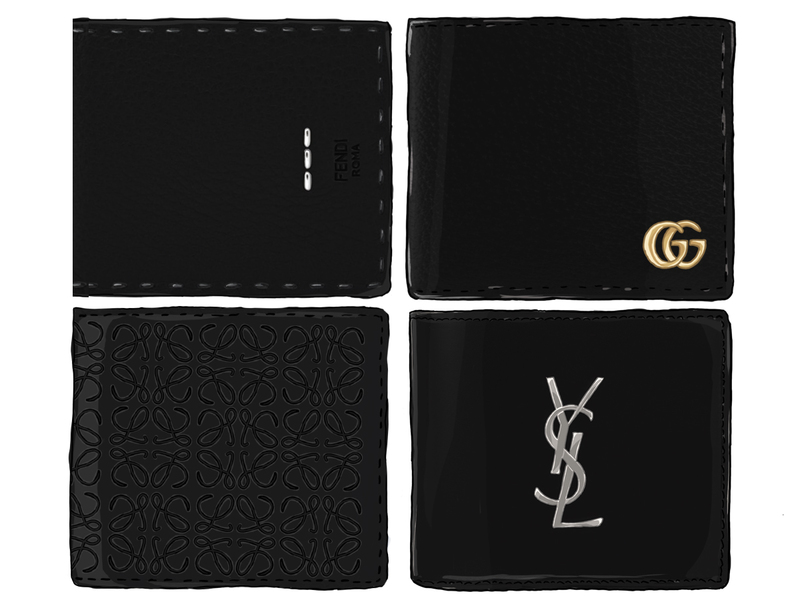 The standout feature of the wallet’s got to be the interlaced YSL initials right in front. Coming in oxidised nickel for that cool, grunge appeal, the otherwise ‘loud’ design is otherwise a simple piece that comes in lush, smooth leather.